RAISE THE BLUFF, a multiple stakes-winning son of classic winner Pine Bluff, entered stud in 2008. He offers breeders a combination of racing prowess, superior conformation and outstanding pedigree. RAISE THE BLUFF won three stakes races and placed in four others, including the Grade 3 Longacres Mile Handicap and the Gottstein Futurity. 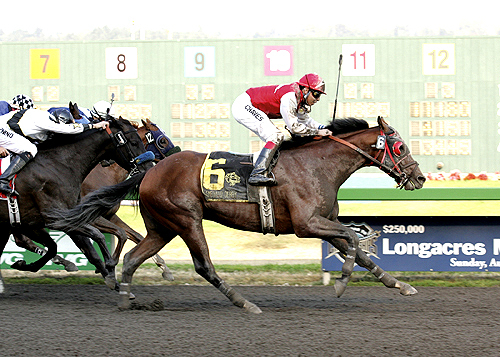 He won stakes at Santa Anita Park and Emerald Downs en route to earning $342,706 from 19 starts over three seasons. RAISE THE BLUFF was a versatile runner, winning at distances from 5 1/2 furlongs to 1 1/8 miles. He was precocious, sound and consistent, and finished on the board in 16 of his 19 starts - including 14 times in stakes company. He won the Santana Mile Handicap at Santa Anita (earning a 102 Beyer) at a distance that is a prime predictor of sire success. RAISE THE BLUFF is by Pine Bluff ($2,255,884), winner of the 1992 Preakness Stakes (G1). A son of leading sire Danzig, Pine Bluff is represented by more than 30 stakes winners and total progeny earnings of more than $32 million. Among his most notable runners are the dual Grade 1 winner I Ain't Bluffing and the Grade 2 winners Super Frolic, Bear Fan and Lil's Lad. RAISE THE BLUFF is out of a winning daughter of 1992 Eclipse Horse of the Year and leading sire A.P. Indy from a female family of numerous stakes winners, including the champion and major sire Lord Avie. His pedigree boasts a double cross to the immortal Northern Dancer and includes influential sires such as Seattle Slew, Hail to Reason, Halo and Secretariat. RAISE THE BLUFF reigned as Washington's leading freshman sire of 2011, with two stakes horses among his first crop of 2-year-olds. He is also the sire of the 2012 Emerald Downs stakes winner Master's Bluff from his second crop of 2-year-olds. RAISE THE BLUFF stands at El Dorado Farms in Enumclaw, Washington. His 2012 fee is $1,000, live foal guarantee. To request a 2013 Breeding Application to Raise the Bluff, click here.